We needed a shed, but we had no money. 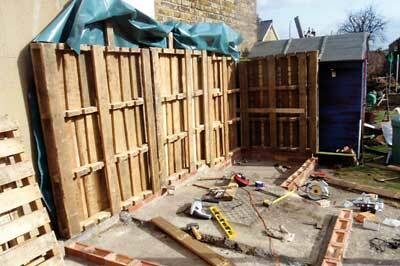 What we did have was two hammers, a drill, a saw and a large tin that was full to the brim with odd screws and nails. All we needed was wood - free wood at that. 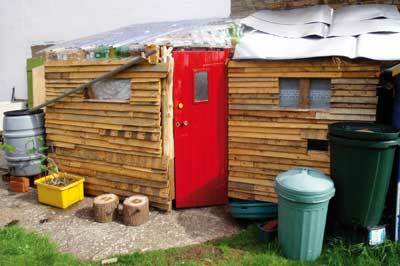 The most abundant source of free wood that was scavengable in an urban environment, is the prolific pallet! 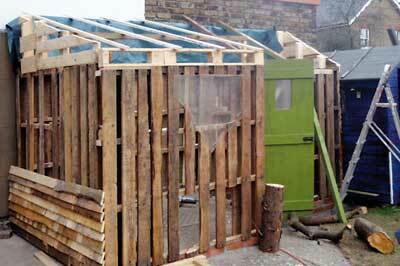 Our goal was to build a shed out of pallets while using permaculture principles to guide us. For years we had toyed with the idea of a reduced commute and a more sustainable way of life, but we had been too squashed down by work pressures and too constricted by our little flat to make any major changes. This was until a year's sabbatical gave us time out to reflect and the opportunity to breathe, when we got on our bikes and off we cycled. Nine months later we returned to the UK with clear heads and hearts and we vowed that henceforth, we would place quality of life at the heart of all our choices. So when setting up house, we looked for a reduced commute to give us more time and as big a garden as we could find in London for crop potential. Living sustainably in an urban environment meant we had to ensure we made the most of what we had. So while my partner went back to 'work', I set about finding ways to make life work for us! 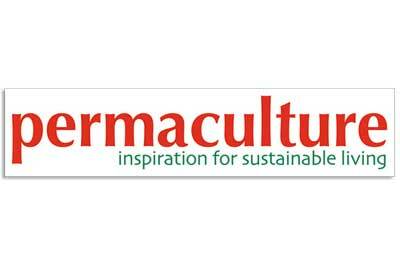 Fresh from my permaculture design course and with a highly restricted budget, I set to designing, planning and thinking about our new 30m garden. Hovering to the side of the garden, but quite close to the house there was a small, dank, breeze block shed, resplendent with an asbestos roof. The shed was on its last legs and rather than have it fall and release all that asbestos into our precious lungs, we decided to dispose of it appropriately. This left us with a concrete hard standing of 8 x 3m, situated in the best growing spot of the site; a little south facing sun trap. There was an instinctive part of me that wanted to take up all that concrete, improve the soil below and grow kiwis and lemons! But working with the principles of efficiency, cost“effectiveness and finding the route of least resistance - and after numerous scale doodles - we decided to turn the problem into a solution and opt for a combination shed/greenhouse. With the hard standing in place already, why not keep it there? While kiwis and lemons are delicious, a survey of our needs quickly highlighted that our preference was for accessible abundant salads and a handy seedling creche. Since we are also renovating and retrofitting our house, storage close to the house is also essential. Let's not be under any illusions here. Neither of us are trained builders, we are two smallish women who are well aware of our limitations, but are confident in our ability to problem-solve and, quite frankly, we are confident in ourselves. 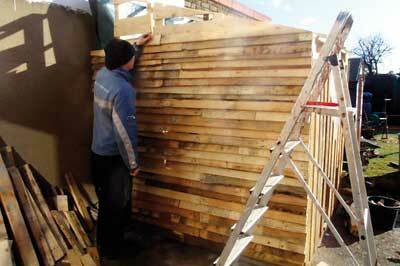 Calling all intrepid pallet builders... here's how we did it. I started by observing the concrete hard standing - not massively exciting but certainly informative. I noticed how the water pooled in certain places and how placing the pallets directly on the ground would see them rotting over time. Since our goal was resilience, we decided to base the structure on a row of brick; this would also offer a level base on which to stack our walls. In our old flat we used bricks as shelving support and rather fortuitously had decided to bring them with us, just in case. Pallet sourcing was no problem: first, we identified our nearest industrial estate, knocked on a few doors and asked if we could help them deal with their rubbish problem. Note: it's important to ask as some companies recollect pallets - simply taking them could turn out to be theft. 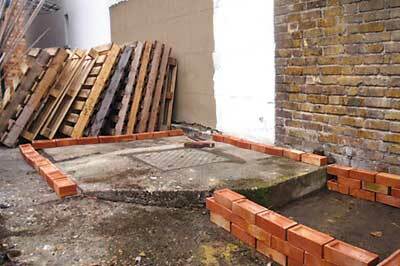 A few simple calculations ensured we got enough to make our basic wall structure. We needed identical big pallets for the back wall, identical medium sized pallets to make the front wall and a mix of both to see what happened at the sides. Once we'd sourced a decent range we decided to 'thin them out' by removing some of the lengths - enough to lighten, but not too many to weaken the structural integrity. According to numerous DIY books and the great web, the corners are the place to start. Balancing two pallets precariously around the back corner, Catherine clung on to them both while I screwed in our 'cross member'. We used wood offcuts to provide diagonal strength across the corner, to hold the pallets together and to ensure maximum use of resources. In a heart-in-mouth moment, Catherine let go and we stepped away and - oh yes! - nothing fell over. We gave it a shake and it all seemed to hold together. Hoorah - robustness! The sides consisted of medium pallets to match the front line, with diagonally cut pallets to make the link between the back height and the front. While a good level of weather proofing is important, airtightness isn't; in fact these mismatched gaps provide excellent ventilation. We had a couple of old pieces of oddly shaped clear plastic and a small rectangle of glass lying around, which was ideal for windows. As the story unfolds, the observant reader might notice just how much we will need this lovely shed, based on the number of items we have 'lying around' - the ultimate re-user needs some place to store all their valuable 'stuff'! So we cut out corresponding holes in the pallet walls before erecting. We used the cladding - coming next - to hold the windows in place from the outside and more of our trusty wood offcuts to hold them in place on the inside. Any spare moment in the build was deemed a cladding moment. To ensure structural cohesion and protection we decided to horizontally clad the whole structure, apart from the back as it was covered with a tough plastic sheet, because it is not subject to weather. It would also be impossible to access for cladding as it butts up against our neighbour's wall - give or take a 100mm gap. To clad the shed we needed a large supply of single pallet slats. If there is any part of this project that was the most laborious, this was it. 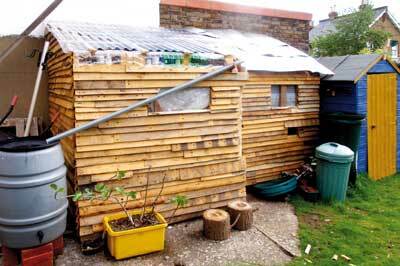 I'm sure there is a more efficient way to finish this type of build, but we were working with what we had - pallets! Rather nerdily, we've learned a thing or two about pallets. It's about trial and error and finding your own technique as some slats just won't budge and others practically fall apart with the slightest hammer blow. We developed a bit of a technique using a hammer and crowbar. YouTube clips on pallet dismantling - yes, they exist! - suggest that others just bash the slats off with a mallet. But, some of those nails run so deep there is no way of getting them out, in which case I cut the wood! We then simply jigsawed them up each wall to produce a rather pleasing rustic effect. We went through a few design ideas with this. We wanted to make the roof out of plastic bottles, so we had a fun evening collecting bottles out of people's recycling, followed by a trip to the local tip. We tried corrugating the bottles - stapling strips of bottle together. We also tried making tiles by flattening the bottles. All to no avail - the problem came in trying to fix them down to something on the roof and with water tightness. Luckily for us it rained during our building process so we could observe any possible roof leakage. There was lots of it. There are many examples of plastic bottles being used successfully to make roofing, but we simply didn't have a way to make the bottles flat enough for tiles and we also started to run out of energy and patience. And so we conceded that it would be necessary to spend a bit of money to buy some plastic sheets, so that we could have our growing space. We zoned the shed so that one section was darkened to store objects that light might cause to perish, while keeping the main area light. For the darker side of the shed we managed to scavenge some aluminium from a skip - perfect favela-style roofing! When we took down the old shed we made sure we kept the door. With a lick of paint and a rejigging of the locking device, we made it work! All in all, the venture cost us a week's solid labour, another in prep and about £45 in roofing and a resupply of mortar for the brick base. It gained us a whole chest full of pride and satisfaction, a secure and watertight shed and a super snugly creche for our seedlings and salads, which I am happy to say are thriving.